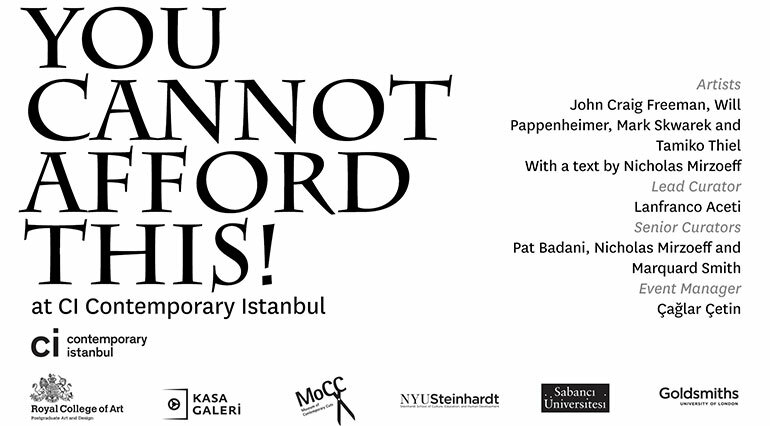 YOU CANNOT AFFORD THIS!, a collaboration between Kasa Gallery and the Museum of Contemporary Cuts at CI – Contemporary Istanbul, is an art event that questions current art market practices and the disruptive nature of contemporary digital media. This continues an international theme that Kasa Gallery has addressed during the past year with a series of exhibitions that reflect upon the nature of contemporary art, politics, neo-capitalism and plutocratic practices. Are the arts inexorably linked to the market? What is the role, if any, for politicized art media practices that bring new critical perspectives and alternative forms of engagement to the corporate art world? Is once again, as in the early avant-garde, the aesthetic choice trapped between total acceptance and total rejection, since the ‘third way’ appears to have failed in the past 20 years? In a climate of profound social and economic cuts, where the lack of social cohesion is bringing forward struggles and tensions, who are the ‘marketable artists’ talking to? Is a commercialized and purely self reflective aesthetic art practice the only option that can be set as a ‘successful’ example of aesthetic contemporary engagement? YOU CANNOT AFFORD THIS! speaks of the return of the social to a ‘market’ and ‘plutocrats’ who cannot afford to understand the social changes that are characterizing the beginning of the 21st century. It speaks of a mindset that perceives anything outside of the remits of the ‘commercially’ and ‘corporate’ sanctioned and viable values as unaffordable objects and practices. In this context, Kasa Gallery and the Museum of Contemporary Cuts (MoCC) present artworks that are strongly aligned with socio-political and cultural statements: Augmented Reality interventions exist beyond and through geopolitical and cultural barriers. A series of Augmented Reality interventions will become materialized objects for sale, but outside the reach of the rich. The price of the art object becomes an obstacle to the acquisition of the artwork. The presence of the artworks is conceived as a non-presence: an engagement where the artists and the buyers cannot recognize each other because they cannot afford to do so and cannot afford each other. Buying is no longer a pleasurable activity but is transformed into a commitment to sacrifice and suffering. The price of the art object is proportional to the wealth of the individual: the richer the person the higher the price. The presence of the artworks and their unaffordable prices continues to carry the message of the artworks: a relentless critique of the system. Kasa Gallery and the Museum of Contemporary Cuts, invited by Ceren Arkman (Director) and Irmak Arkman (Art Director) of Plugin at CI – Contemporary Istanbul, present artworks by John Craig Freeman, Will Pappenheimer, Mark Skwarek and Tamiko Thiel. The event YOU CANNOT AFFORD THIS!, at CI – Contemporary Istanbul,will precede the opening of two new exhibitions by the same artists: I Occupy at Kasa Gallery and Jackpot at MoCC (Museum of Contemporary Cuts). YOU CANNOT AFFORD THIS!, Jackpot and I Occupy are collaborations between MoCC, Kasa Gallery, OCR, Goldsmiths, NYU Steinhardt and the Royal College of Art. CI – Contemporary Istanbul: November 7 to 10, 2013.